Crocodiles the strongest immune system in the world. It's because of this that the KWENA Crocodile Oil Balm was created as a healing product as well as a beauty product. It contains oil that is obtained from crocodile fat (more on this in a moment) along with either lavender or tea tree oil, grapeseed oil and real beeswax to create a 100% natural, easy to apply balm that claims to heal a whole array of different conditions from burns to acne. In addition to this, it can also be used as a moisturiser and also on babies and dogs. So, pretty multifunctional then!? 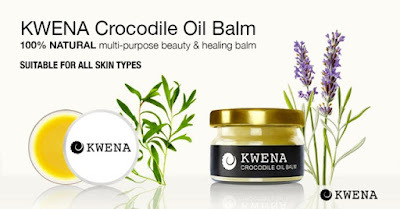 KWENA is a brand from South Africa that specialise in the use of crocodile oil in their products (the word Kwena is also the Sotho-Tswana word for crocodile in South Africa). They obtain the oil in an ethical way, using the crocodile fat that is discarded as a byproduct from a CITES verified crocodile-breeding farm. The oil is then blended with beeswax and the finest essential oils to create the multi-purpose balm that is suitable for all skin-types. Thanks to its anti-inflammatory and antiseptic properties, the balm can be used for (take a deep breath) burns, cuts, spots, nappy rash, dandruff, blisters, anti-ageing, eczema, stretch marks, discolourations, scars, insect bites, shaving rash, sunburn, as an eye cream or even on dogs as well as many other uses (and breathe!). To use, apply a small amount to wherever you need it. A little goes a long way! Having a son who is pre-school age, grazes, bumps and cuts are common place thanks to all of the climbing and playing. I tried this balm on a grazed knee and I have to say that it healed in half the time that it would normally without the use of it. I'll definitely be keeping this nearby for future tumbles! I haven't been able to test out the Crocodile Oil Balm on nappy rash as of yet as we haven't needed to, so I can't yet make any comment in regards to how well it works in this area. On spots I find that it does get to work pretty quickly on any redness, particularly post-blemish redness. Due to its anti-inflammatory properties it does help to reduce the size of spots overnight as well, but it definitely works better as post-blemish treatment that helps to reduce scarring. If you're an acne sufferer I can imagine this being a great little product to keep at hand! I tend to get incredibly dry and itchy skin just on the inside of my ear, so I gave this balm a go there too. Whilst it does need re-applying throughout the day, I find that it helps to keep the area moist and therefore far less itchy. As a moisturiser it works really well, but it works best on dry skin and less so on oily skin as it makes the skin look shinier. Another great use for this product is after shaving. If your skin is prone to irritation post-shave, this balm can help to soothe and clear it. However, it’s easier when used over smaller areas rather than all over as it could take a long time to apply over a larger area. Therefore, as well as being helpful for areas such as underarms or bikini lines, this could also be good for men who are looking for a product that is suitable for their face post-shaving. I recently managed to scald my finger with boiling hot water from the kettle (clever, I know), so I reached out for this balm to give it a try on scalds. Within a couple of minutes the sting had vanished. I re-applied the Crocodile Oil Balm roughly an hour later and I haven’t had any trouble with it whatsoever since. A few days later, my sister gave me a shout because our mum had told her all about this balm that I’d been talking about that had helped with my scald. She had burnt her ear whilst straightening her hair and wanted to try it too. Later on that day she let me know that her ear felt a hundred times better, as if she’d never burnt it! Therefore, if you have a tendency to catch your ear during hair straightening, this could be handy to have close by. This has been pretty helpful for dry cuticles, helping to keep the area moisturised. It also worked well on an annoying hangnail that I had to deal with recently! Particularly good to apply at the end of the day, especially if your hands tend to get quite dry. Overall, I’m a fan of this little multi-tasker. I’ve found myself reaching out for it pretty much on a daily basis for a whole range of different reasons and I think that having one product for so many different things is incredibly useful and practical. Rather than having to rummage through tubes and pots to find what you need for each different issue you have one pot there waiting and ready. I find that this works best on ailments such as burns and cuts, but as a beauty balm you can benefit from this if you apply it directly to spots or onto dry skin for a great moisture boost. I think that this is the type of product that most parents would find helpful. You will find so many uses for it and it is great for all of the family. You will like it even more if your children are prone to little bumps or tumbles! This balm is so multi-funtional. Even if you purchase it to help with one condition, I'm certain that you will end up reaching out for it for a whole bunch of other reasons before you know it. 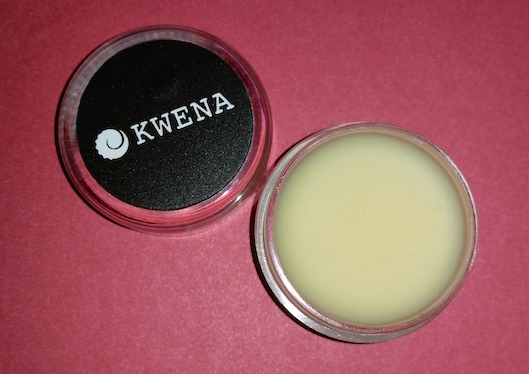 You can purchase the KWENA Crocodile Oil Balm for €18/15ml or €30/30ml from KWENA. What are your thoughts on the KWENA Crocodile Oil Balm? Do you prefer handy multi-tasking products over a collection of different ones? *This product was sent to me to sample by KWENA. However, this hasn't in any way affected my review with all thoughts and feelings about the product being 100% my own and those of other contributors to the review.